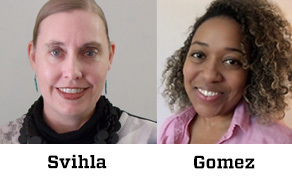 On September 27th, 2018, Vanessa Svihla and Jamie Gomez’s paper "Rurality as an Asset for Inclusive Teaching in Chemical Engineering" was recognized for its contribution to the field of Diversity in Education. The manuscript won the esteemed Christine A. Stanley Award for Diversity and Inclusion Research in Educational Development award from the Professional and Organizational Development Network (POD). According to the award committee, the papers which win this award “raise the awareness of and advance theory about diversity- and inclusion-related issues in educational development; contribute to increased understanding of best practices on diversity- and inclusion-related issues in educational development; and recognize how POD’s values of diversity and inclusion are reflected in the everyday practice of educational development.” The Professional and Organizational Development Network is a well-known organization within faculty and educational development in higher education. Their leading journal “To Improve the Academy” is well known in the faculty development field. This accolade came after Prof. Vanessa Svihla had been recognized to receive the American Society for Engineering Education Gulf Southwest Section Outstanding Young Faculty Award. She was selected for the award during the 2018 ASEE-GSW Section Annual Conference April 4-6, 2018 in Austin Texas where the selection committee stated they were impressed by her qualifications and achievements. The award was announced April 17th, 2018.